I went to work yesterday and I was tired as f*ck when I came back.. Just when I wanted to jump into my bed my vans order came in from a week ago. All my need for a nap were blown away instantly. Taped the whole thing up and started painting till late in the night.. But I also had to work today so finished it off this afternoon. Enjoy this fresh new custom Vans Atwoods, only a iris blur was added in photoshop to keep the colours like they are in real life. I also have another pair of Vans, I might want to customize those too.. but I want to sell them. 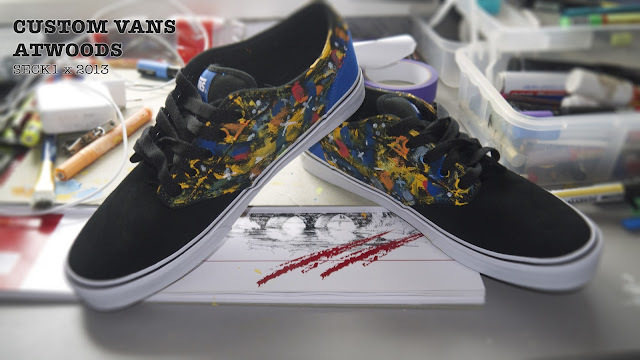 So if you like some custom Vans Atwood LP's in size 9,5 US, contact me with ideas!